Pair the fish with an Austrian wine- Grüner Veltliner - now available locally in better wine stores. And the dessert with an Austrian Spät-Auslese (a sweet wine). 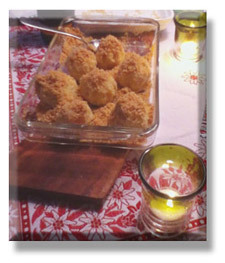 Watch Susanne Servin prepare Marillenknödel von Topfenteig (apricot dumplings) as shown below on YouTube. Mix cottage cheese until completely smooth, add the eggs, salt and then gradually mix in the flour; stir mixture (dough) until completely smooth and thick enough to form a roll (if not add more flour, if too thick add a little milk). Bring a large pot of water to a roiling boil, ad a pinch of salt to the water. Meanwhile divide dough into equal portions, cover fruit with dough completely by wrapping firmly around the apricot; make sure the Knödel (dumpling) is well sealed. Toast the bread crumbs in a frying pan in butter until golden brown. Meanwhile drop the Knödel (dumplings) into the boiling water and stil gently from time to time so they won’t stick to the bottom. Knödel will float to the surface after five minutes; cook another five minutes then do a test Knödel and if done, remove the dumplings with a strainer from the water and carefully dip themn into the bread crumbs, coat evenly and dust with powder sugar, then eat – yumm!! * These dumplings can also be made with small, tart peaches and Italian plums. The Turks occupied Vienna in the 17 th centuries for years. With the help of the Polish king John Sobieski they were driven out of Vienna. One of the things Vienna got from the Turks was coffee ( more at another time) and the crescents ( a pastry shaped after the symbol on the Turkish flag). 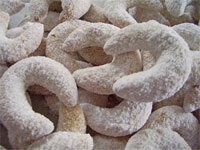 The crescent "Kipferl "became a favorite of the Viennese for breakfast. The shape was used by bakers for crescent shaped cookies. Combine all ingredients (except powder sugar and vanilla bean) quickly to a smooth dough Turn the mixture unto a pastry board and quickly knead into a smooth ball. Refrigerate for 1 hour. Now roll out the dough 1/2", form into tubes and cut these into 3/4" rpieces. Roll pieces in your hands to form crescent shapes. Arrange Kipferl on an ungreased baking sheet, 1 " apart. Bake the Kipferl for 15 to 20 minutes or until golden. Let cool slightly. Meanwhile split the vanilla bean and scrape out tiny seeds and mix with confectioners sugar. Dredge the warm cookies in the sugar mixture and let cool completely. These cookies will keep very well in a cool place in an airtight container. NOTE: to make vanilla sugar place the vanilla bean in a canister of confectioners sugar for approx. one week. Rumored to be called after the Duke of Malakoff (a French Marshall) who was involved in the battle of Malakov in the Crimea – 1855 - and then after he won the battle he was named after it. 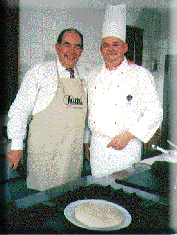 The chef at his palace in France knowing the duke had a sweet tooth, created the Malkoff Torte for him. Stir butter and beat until foamy. Add sugar and egg yolks, then stir in almonds (or hazel nuts) and mix well, last gently spoon in sweet cream, rum (or cognac) and coffee (optional) and mix again. Now lay one layer of lady fingers close together on the bottom of the cake form, sprinkle with a little rum; spread part of your butter crème over them, then again a layer of lady fingers (sprinkled with rum), spread crème and so on – the last layer should be lady fingers. Now cover the cake form with a piece of parchment paper, lay a heavy item (I usually use a rock) on it and stand it overnight in the refrigerator. The next day take the cake out of the spring form, cover with the meanwhile whipped cream, and then decorate for the occasion. Grated dark chocolate looks good and is simple to do. 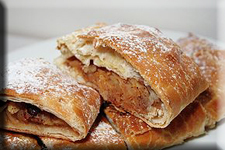 recipe from ol Austrian cook book "Wiener Küche"
Watch Herzerl Tours host and proprietor Susanne Servin share her Apfel strudel family recipe with you. As shown below on YouTube. 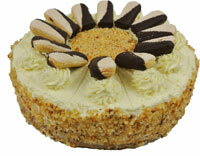 A taste treat you won't want to miss! This classic recipe is usually made with home made or frozen strudel dough, but phyllo dough works well too and is quicker. Peel, core & slice apples thin; as you slice them put peeled apples in a bowl of water & one small squirt of lemon juice to avoid browning. Mix sliced apples with sugar, vanilla sugar, cinnamon, lemon zest, juice from one lemon, and rum in a bowl -blend together well. While doing this roast bread crumbs with a little butter in a pan. When brown take off flame and mix with raisins; then add to apple mix. Melt butter over low flame. Put five layers of Philo on white flour-dusted sheet. Coat each layer well with melted butter. Cover 1/3 of the buttered top dough sheet with the apple mixture (not too close to edges), fold edges in. Use pastry brush and melted butter like glue to tape edges. By picking up the two ends lift the white sheet (tablecloth) to gingerly roll the dough into a big "sausage". Brush entire strudel well with melted butter. Pick-up strudel carefully and place strudel on a well-oiled cookie sheet and bake in oven for about 30 to 40 minutes at 375º F.
While baking whip cream to “SCHLAG” –whipped cream. Place finished strudel to cool before dusting with powdered sugar. PUBLISHED BY HERZERL TOURS ON JAN 1, 2013. These recipes will all be part of the soon to be published cook book A Taste of Vienna  by Herzerl Tours.